Broccolini is a member of the cruciferous vegetable family. Also known as tenderstem broccoli in Ireland and the United Kingdom, broccolini is fast becoming a world-wide favorite. It has a milder and sweeter taste than broccoli and has tender stalks that can be cooked whole without peeling. Japanese seed company Sakata developed broccolini by crossing broccoli with kai-lan, which is also called Chinese broccoli or Chinese kale. 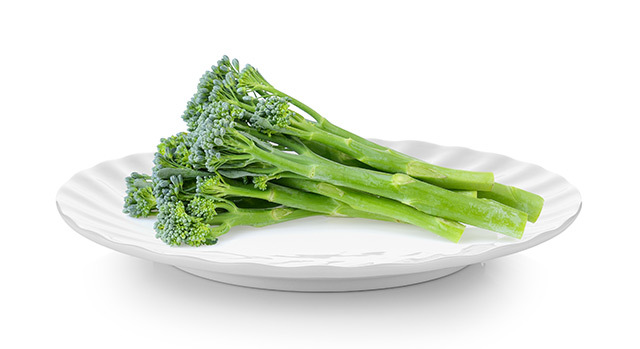 Broccolini is called by other names such as broccolette, broccoletti, asparation, and bimi, and thrives in foggy weather and moderate summer temperatures. Broccolini has cancer-fighting elements that help prevent the onset of or totally prohibit cancer cell growth to stave off the development of carcinogenic tumors that cause breast, bladder, prostate, stomach, colon, and lung cancers. Broccolini normalizes blood pressure and cholesterol levels, thereby preventing the risk of diabetes. Broccolini is perfect for weight-watchers, as it helps curb appetites and makes people fell full, ensuring that those who ingest it will not eat so much during their next meal, so they can shed those extra calories. The glucosinolate and glucoraphanin that are present in broccolini aids in detoxifying and repairing skin cells, thus preventing skin damage and deterioration. Broccolini is good for expecting mothers because it contains huge amounts of iron and folic acid, which are good for the baby’s development in the womb. Broccolini is good for the digestive system. It prevents gastrointestinal issues such as constipation, ulcer, and gastroesophageal reflux disease, and provides for regular bowel movement. Broccolini is good for the nervous system. Its high amounts of potassium, calcium, and magnesium provide for optimal brain and mental function. Broccolini is good for the muscular system. It provides for sustainable muscle growth and development. Broccolini is good for the cardiovascular system. It has been known to prevent the onset of certain heart ailments. Broccolini is good for the skeletal system. Its considerable vitamin K amounts provide for proper bone development and promoting calcium absorption in the body thus resulting in stronger bones, decreasing the chances of osteoporosis and other bone-related diseases. Since broccolini needs less cooking time than most vegetables, they are perfect for sauteing. They can also be prepared as side dishes with other vegetables, and taste great when seasoned with lemon juice, vinegar, olive oil, pepper, garlic, and salt. It can also be used as a great addition to fried rice because of its crunchy and crispy texture. Other broccolini meal suggestions include whole-wheat pasta with broccolini and feta, roasted broccolini with winey mushrooms, sauteed broccolini with pine nuts and garlic, grilled broccolini with lemon-parmesan breadcrumbs, oven-roasted broccolini with asparagus, sausage and broccolini risotto recipe, roasted broccolini and baby carrots with kale pesto, and chicken broccolini with mustard cream sauce. Broccolini is good for the digestive, nervous, muscular, cardiovascular, and skeletal systems. Broccolini has cancer-fighting elements that help prevent the onset of or totally prohibit cancer cell growth.